Eurdise and William had a fun wedding day at the heart of Brooklyn. The bridal party was getting ready in a hotel room close to the church where William was anxiously waiting to see Eurdise for the first time on their wedding day. 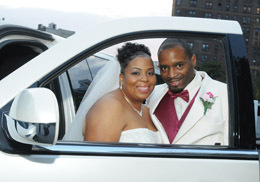 As already wife and husband they took a limo ride to Prospect Park Grand Army Plaza for a fun photo and video shoot. After posing for our wedding photographer they enjoyed a sip of champagne. At the reception party William was entertaining his bride and the guests with a special love song.